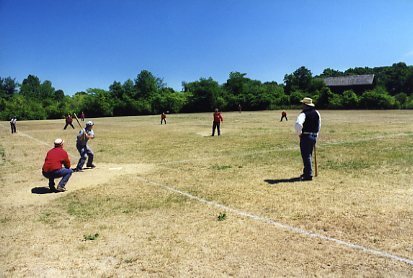 A photograph taken at Old Bethpage Village Restoration of a vintage baseball game. 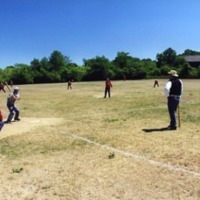 The umpire and catcher are visible in the foreground while opposing team members, who are wearing red, can be seen in the background. The batter is waiting for the pitcher to throw the ball. Harrison, Robert L., “Baseball game,” Hofstra University Library Special Collections: Digital Collections, accessed April 18, 2019, https://omeka.hofstra.edu/items/show/690.